PARAMUS, N.J., April 21, 2015 /PRNewswire/ — Coach USA and megabus.com – the popular city-to-city, express bus company – today announced a multimillion dollar investment in a hi-tech eco-driving system for their bus operations across the United States. Beginning this month, 3,200 megabus.com and Coach USA drivers will start using the GreenRoad system to help reduce fuel consumption and carbon emissions, improve customer comfort and cut the risk of accidents. Megabus.com and Coach USA are targeting a 3 percent reduction in fuel consumption using the technology, which is being rolled out on its fleet of 2,400 buses. This initiative follows a successful pilot program in the UK in which a 3 percent improvement in fuel efficiency was achieved across UK bus operations. A key element of the initiative will be a Green Driver incentive program giving employees the chance to earn “green points” for safe, efficient driving that are converted into financial benefits from a potential $1 million annual bonus pool. The GreenRoad Driver Behavior solution uses a dashboard traffic lights-style system to provide drivers with real-time feedback on their driving style, including speed, braking, acceleration, lane-handling and turning. Driving decisions are responsible for 90 percent of all accidents and up to 33 percent of fuel spend, according to research by GreenRoad. All megabus.com and Coach USA drivers already undertake a Safe, Skilled and Fuel Efficient Driving training program as part of a Certificate of Professional Competence. The GreenRoad system incorporates online reporting, analysis and coaching to help drivers work with their managers to further improve their skills and decision-making for a safer and more pleasant experience for the customer. Megabus.com and Coach USA also uses GreenRoad’s new engine idling solution to further improve fuel performance. It is able to focus on specific vehicles or trips to identify unnecessary idling based on agreed thresholds. The sophisticated system is able to differentiate this from unavoidable idling that occurs at traffic lights and junctions. 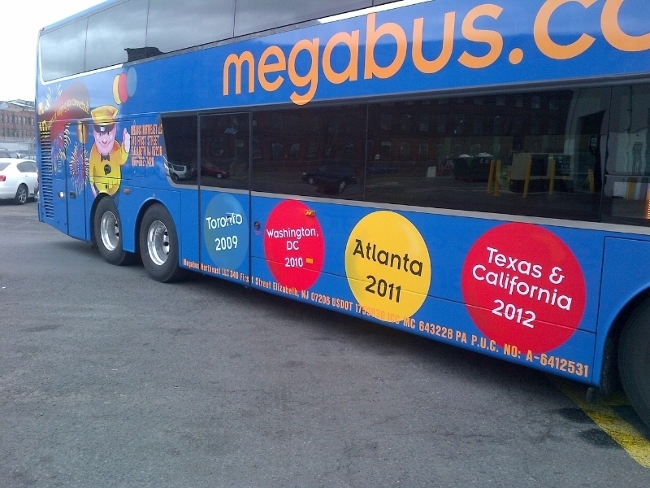 Megabus.com, a subsidiary of Coach USA, launched in April 2006 and is one of the largest city-to-city express bus service providers in North America. In addition to affordable fares, megabus.com offers customers state-of-the-art, green-certified double-decker buses with free Wi-Fi, power outlets, restrooms and are wheelchair accessible. Megabus.com equips every bus with three-point lap/shoulder seat belts, providing the top safety standard for megabus.com’s 40 million customers in more than 120 cities across North America. Visit www.megabus.com or www.coachusa.com for additional information about the service, schedules, arrival and departure times and fares. Megabus.com operates service to/from more than 120 major cities in North America from 23 hubs in Atlanta, Baltimore, Boston,Buffalo, Chicago, Cincinnati, Cleveland, Columbus, Gainesville, Los Angeles, Memphis, Mobile, New Orleans, New York, Orlando,Philadelphia, Pittsburgh, Richmond, San Francisco, St. Louis, Texas Triangle (Austin, Dallas, Houston, San Antonio), Washington, D.C. and Toronto – creating more than 1,000 new, professional jobs during the past eight years. Coach USA, Inc., is one of the largest transportation companies in North America, and maintains the highest safety compliance rating (Satisfactory) from the US Department of Transportation’s Federal Motor Carrier Safety Administration. Paramus, N.J.-based CoachUSA owns and operates 25 local companies in North America, some that have been in business for more than 75 years, which operate scheduled bus routes, motor coach tours, charters and sightseeing tours. Visit www.coachusa.com for more information.